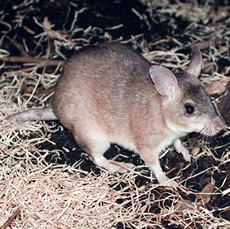 The Malagasy giant jumping rat is a large, rodent found only in Madagascar. It is the largest rodent in its range and can grow as large as a rabbit. And like the rabbit, this rat has long, pointed ears and large, muscular rear feet used for jumping. It can leap almost three feet into the air to avoid predators, although its normal mode of movement is walking. Both male and female are the same size, reaching up to 13.8 inches (35 cm) in length and weighing up to 3.31 lb (1500 grams). The tail can reach up to 9.84 inches (25 cm), and the ears can reach up to 2.23 inches (60 mm). Their upper parts are gray, grayish-brown, or reddish in color, and the head is usually a darker shade. This species prefers sandy costal areas and dry deciduous forest for its habitat. It has been observed in long deep burrows that are about 16.4 feet long consisting of one to six holes to enter or exit. Malagasy giant jumping rats are completely nocturnal. When foraging, they move on all fours, searching for fruit fallen from trees, nuts, leaves, and seeds. They have also been observed stripping bark from trees, digging for roots and invertebrates. Males and females prefer to remain as monogamous pairs for life, both members defending their territory from other rats. They even mark their territory with urine, feces, and scent gland secretions. Females give birth to one or two young after a gestation period of 102 to 138 days. The Malagasy giant jumping rat is one of the most endangered mammal species of Madagascar. It is threatened by habitat destruction due to slash and burn agriculture and logging. The species is also in competition with the introduced black rat. Some Malagasy giant jumping rats can be found in Kirindy, a protected area and research center which has uncovered much of what is known about the species. The remaining population estimate is 11,000. The Durrell Wildlife Conservation Trust is currently working with Malagasy locals to protect and preserve the remaining population. Copyright Notice: This article is licensed under the GNU Free Documentation License. It uses material from the Wikipedia article "Malagasy giant rat". Glenn, C. R. 2006. "Earth's Endangered Creatures - Malagasy Giant Jumping Rat Facts" (Online). Accessed 4/23/2019 at http://earthsendangered.com/profile.asp?sp=2234&ID=1. Need more Malagasy Giant Jumping Rat facts?